Have you (or anyone you know) actually experienced the amazing results that you’re supposed to be getting by practicing the principles of the Law of Attraction? Have you ever noticed that people who regularly practice the Law of Attraction rarely manifest their desires?…(beyond good parking spaces)? Are you one of them? Are you one of the majority who has learned to patiently wait for your desires to manifest? Are you still waiting? If so, author Carnelian Sage says to be prepared for a really long wait. If this is all true, is everything we once believed about the Law of Attraction now lost? Is the Law of Attraction a hoax or worse…a bunch of b.s.? 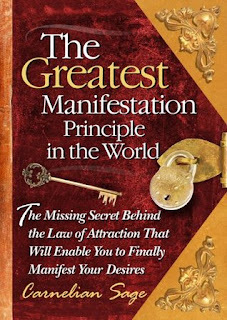 In her book, The Greatest Manifestation Principle in the World, Carnelian Sage reveals what she calls the “missing secret” behind the Law of Attraction that will enable us to finally manifest our desires. Although she calls it a “secret,” she readily admits that it has never been a secret at all. Actually, it is a spiritual truth that no one seems to be talking about in conjunction with the Law of Attraction and the manifestation of our desires. So what is this mysterious principle of manifestation that she is referring to? Are you ready? It’s L-O-V-E.
That’s right. Love is the greatest manifestation principle of all. Love, in this context, is not a feeling or emotion. It is a state of being, an attitude toward everything and everyone (including yourself) at all times, in all ways. Carnelian Sage says that as a state of being, love transforms and becomes the most powerful magnetic force in the universe. How did she discover this “power of love,” the greatest manifestation principle of all? After studying manifestation and the Law of Attraction for over twenty years in individual case histories and through books, courses, DVDs, teachings, and practices including The Secret, The Science of Getting Rich, Abraham-Hicks, affirmations, hypnosis, quantum mechanics, and others, she found that there was a “missing ingredient” to the way that the Law of Attraction was being taught. Initially, she says that she did follow and try to apply all of the teachings that she learned, but her results were “hit or miss” at best. “Even if you focused on what you wanted 24/7 – took your focus away from the things you don’t want, visualized your desire vividly, and expressed gratitude every step of the way – you would still fail to take your desires from formless to concrete expression. That is because this popular ‘ask-believe-receive’ formula for manifesting desires – even though it is supposedly supported by quantum physics and Scripture – is not what causes desires to manifest. What she discovered after repeated failures was that contrary to popular belief, it’s not your mental focus that manifests your desires. Rather, it is how well you connect to, or how much you are in harmony with, the universal energy field which is responsible for all of creation. She calls this universal energy field “God” (but it is also known as “Source Energy,” or the “Universe,” or whatever else that you decide to call it). Connect to this universal energy field. Allow your heart’s desires to manifest. She says that God already knows what you want even before you ask it. Therefore, the only thing you need to do is reconnect to the incredible, unlimited power of this universal energy field and let it bring you what your heart truly desires. She does acknowledge that while it is possible to get some results by focusing on results only and not the love from the universal energy field, the results and outcome will not be as satisfying or lasting as love-based results. What are the benefits and results from focusing on “love,” the greatest manifestation principle of all (instead of your desires)? Freeing yourself from past concerns and wasteful preoccupations. Gaining an irresistible charisma to which people are magnetically drawn. Improving your entire outlook on life and relationships. Gaining excellence in any field of human endeavor that you select. Attracting like-minded people spontaneously, people who will be instrumental in the fulfillment of your desires. Able to easily let go of the non-essential and even harmful things in your life. Raising your energy level and the energy level of anyone in your vicinity. How do you connect to the universal energy field and use “love,” the greatest manifestation principle of all to manifest your desires? “Love’s Pathway” is an exercise that is deceptively simple and takes less than five minutes to complete. It is practiced once a day (or more often if needed). How powerful and effective is practicing the “Love’s Pathway” exercise daily? “When you awaken to the full realization that you are love, and practice the Love’s Pathway exercise regularly, you perpetuate that state – and it becomes the ‘normal cruising altitude’ of your life. That’s when miracles begin to happen. If you would like to learn more about the powerful Love’s Pathway exercise and the principles discussed here, check out The Greatest Manifestation Principle in the World by Carnelian Sage. It is a very quick read and could very well be the missing piece that you have been looking for to manifest your desires easily.